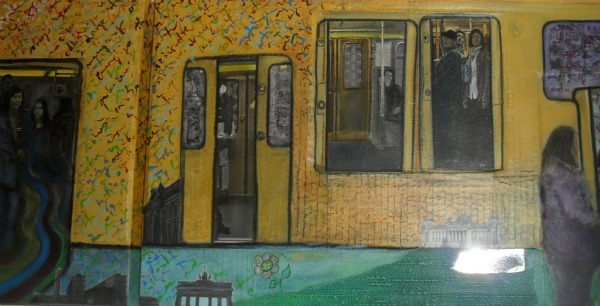 This artwork is about the train – metro line in Berlin, which obsessed me when I used it too much as the everyday way of getting around. People in the metro could be from anywhere and who knows where they are going and who they are. They share this space and time while traveling and then they go their separate ways, disappear from your life. But still, somehow, they stay in your story. 30x30cm, 30x40cm and 100x30cm) and combined to form a single piece. Left side of the artwork. Right side of the artwork. Detail of central left part. Last canvas of this artwork – detail.